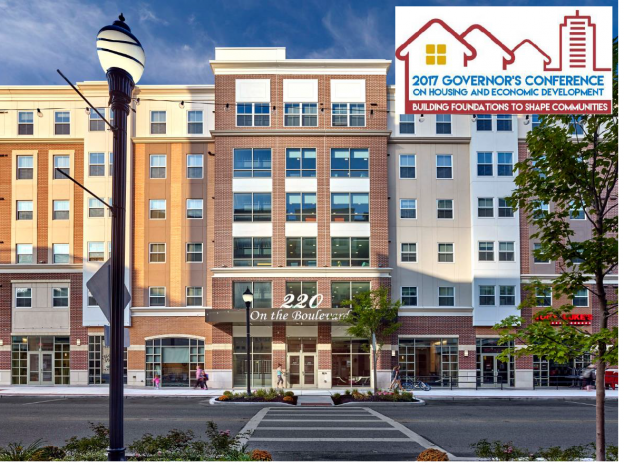 220 Rowan Boulevard received the Leading Public-Private Economic Development Partnership Award at the 2017 Annual Governor’s Conference on Housing and Economic Development. The Leading Economic Development Award recognizes an alliance between a New Jersey-based business that has teamed up with the state, a community, or local economic development organization to advance the redevelopment of downtowns, and enhance the quality of life for residents. The partnership should advance the sate’s overall vision for building tomorrow’s living and working communities. This award was given to 220 ROWAN BOULEVARD, located in Glassboro. This project is a key component in the borough’s downtown redevelopment and features 28,000 square feet of medical space, 20,000 square feet of retail space, and student and market-rate apartments. The new six-story building occupies formerly dilapidated downtown real estate, and is part of a $425 million project linking the Rowan University campus with Glassboro’s retail district, creating a traditional college town and walkable community, and promoting smart growth. The project partners are Nexus Properties, the Borough of Glassboro, Rowan University, Blackney Hayes Architects and M&T Bank. This entry was posted in News on October 16, 2017 by Kathy Ward.